The Film Foundation and Vanity Fair Magazine co-hosted a special evening that celebrated the art and history of film. Surrounding Vanity Fair’s 20th Anniversary Celebration, the event took place on September 18, 2003, at the Directors Guild of America in Los Angeles. The program was the first in a series of events in which the two organizations will collaborate, to increase the visibility of film as an art form and raise awareness of the important and urgent need for film preservation. The evening featured a discussion with Brian Grazer and Ron Howard, moderated by Robert Rosen, Chair of The Film Foundation’s Archivists Advisory Council. The program included films selected by Grazer and Howard -- BLAZING SADDLES (1974, d. Mel Brooks), SCARFACE (1983, d. Brian de Palma), ONE FLEW OVER THE CUCKOO’S NEST (1975, d. Miloš Forman), BONNIE AND CLYDE (1967, d. Arthur Penn), and THE GRADUATE (1967, d. Mike Nichols) -- and explored the impact the films have had on these celebrated filmmakers. 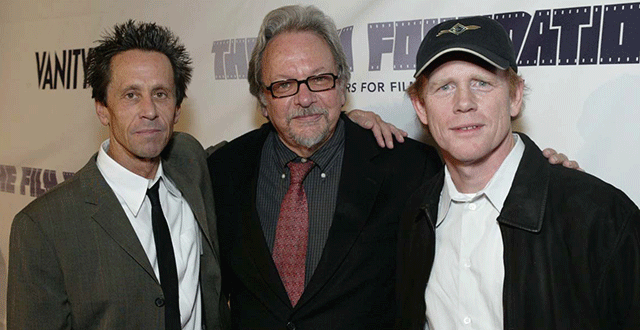 Picture: Brian Grazer, Ron Howard, and Robert Rosen at the Reel Talk event in Los Angeles.